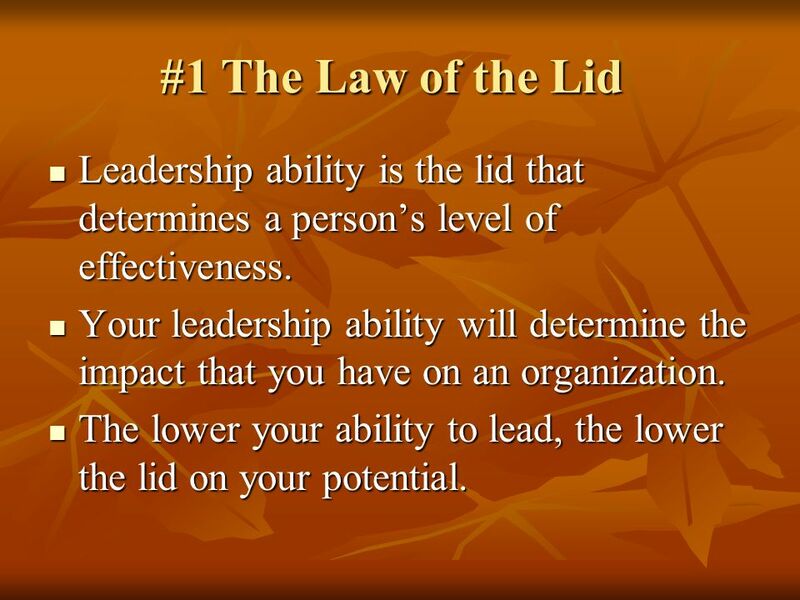 2 #1 The Law of the Lid Leadership ability is the lid that determines a person’s level of effectiveness. 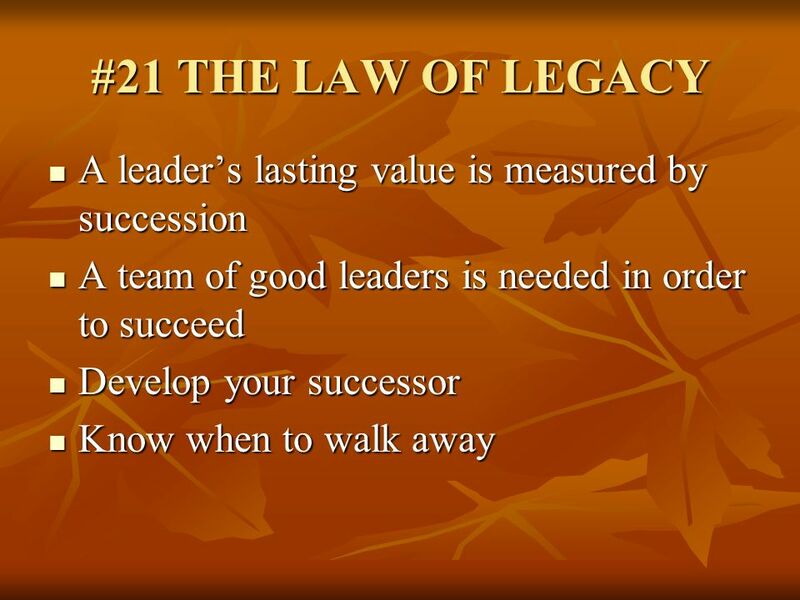 Your leadership ability will determine the impact that you have on an organization. 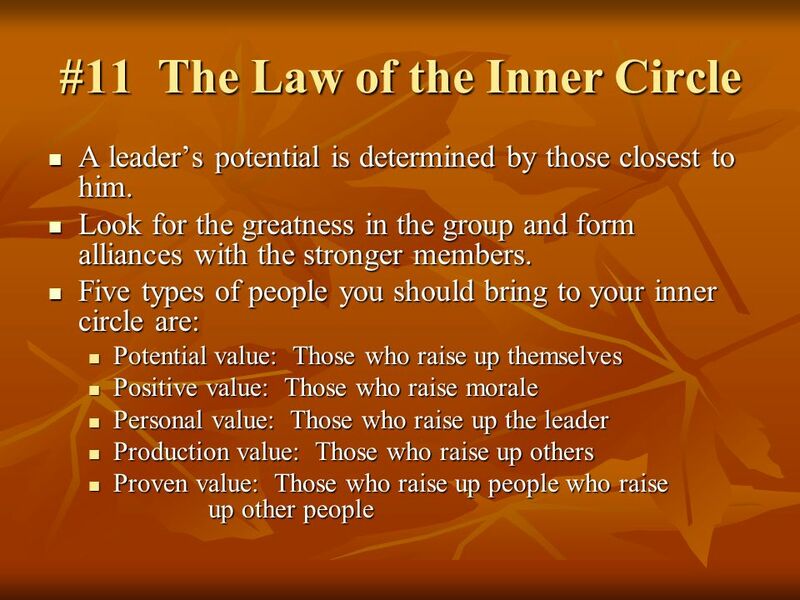 The lower your ability to lead, the lower the lid on your potential. 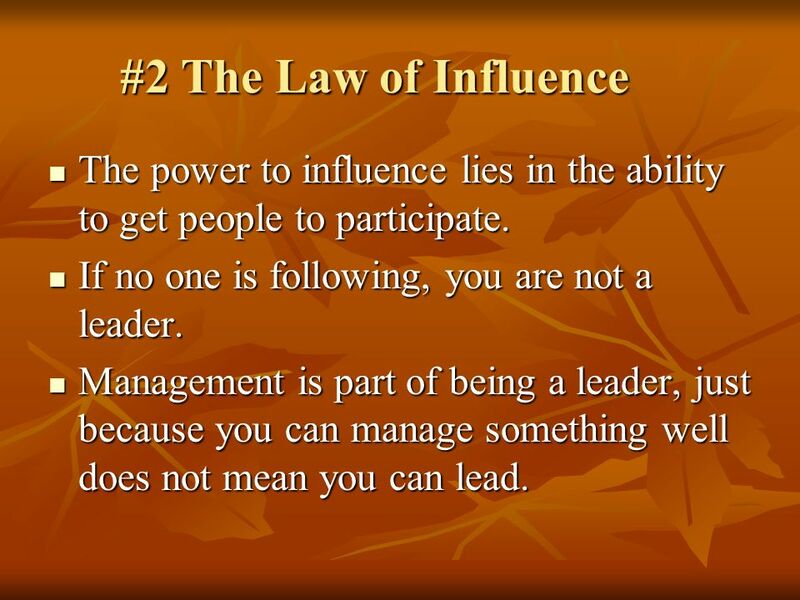 3 #2 The Law of Influence The power to influence lies in the ability to get people to participate. 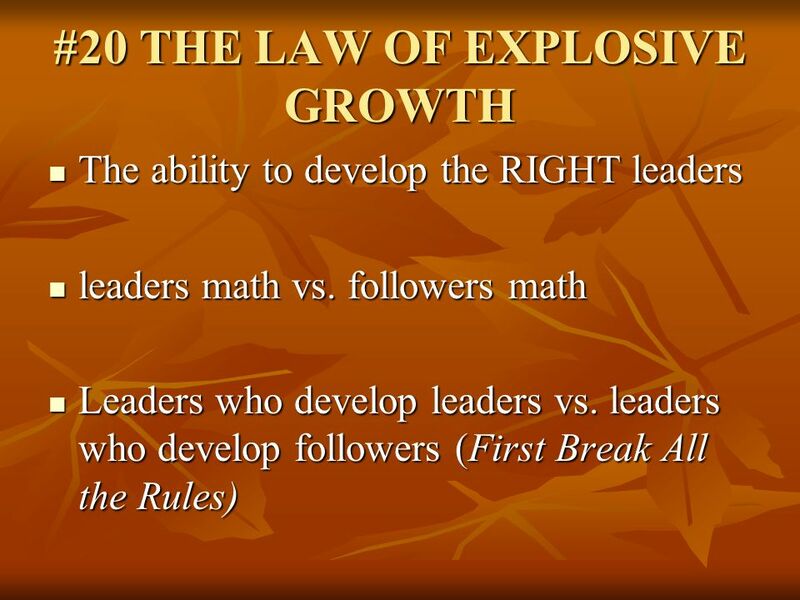 If no one is following, you are not a leader. 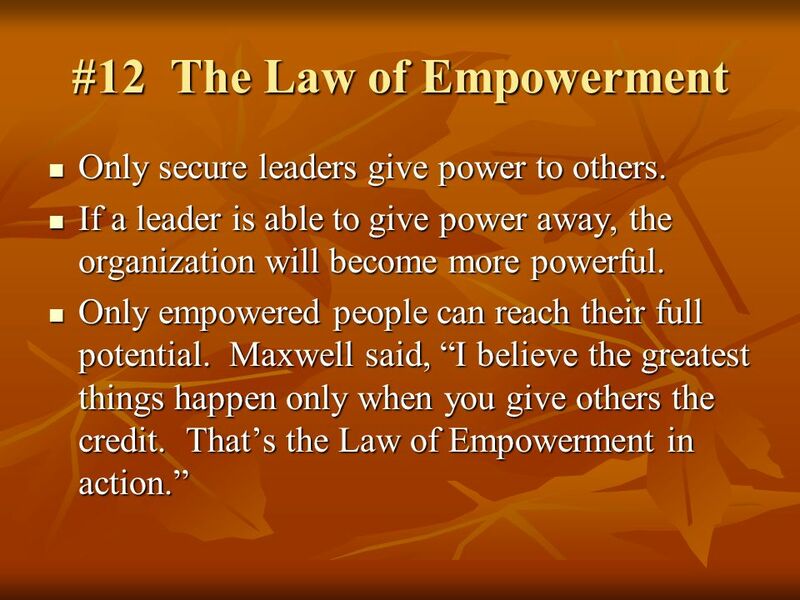 Management is part of being a leader, just because you can manage something well does not mean you can lead. 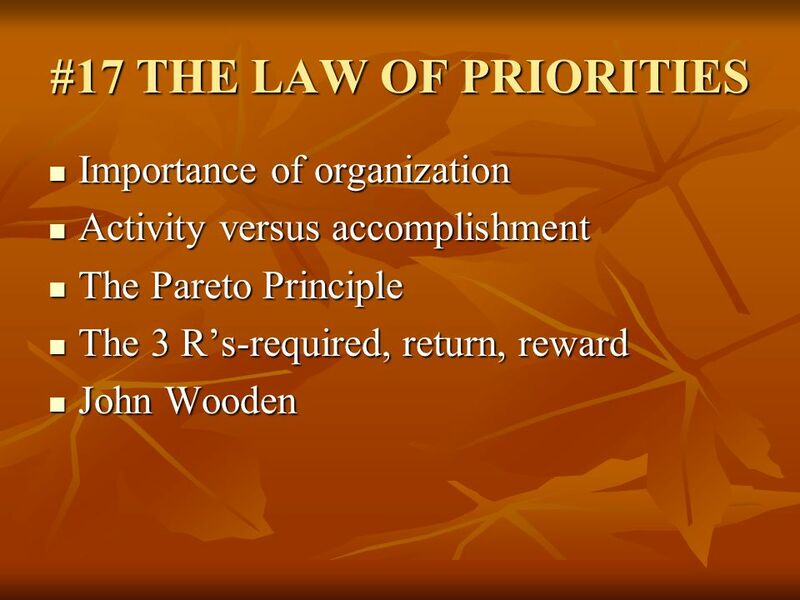 4 #3 The Law of Process This law shows that what matters most is what you do over the long haul. 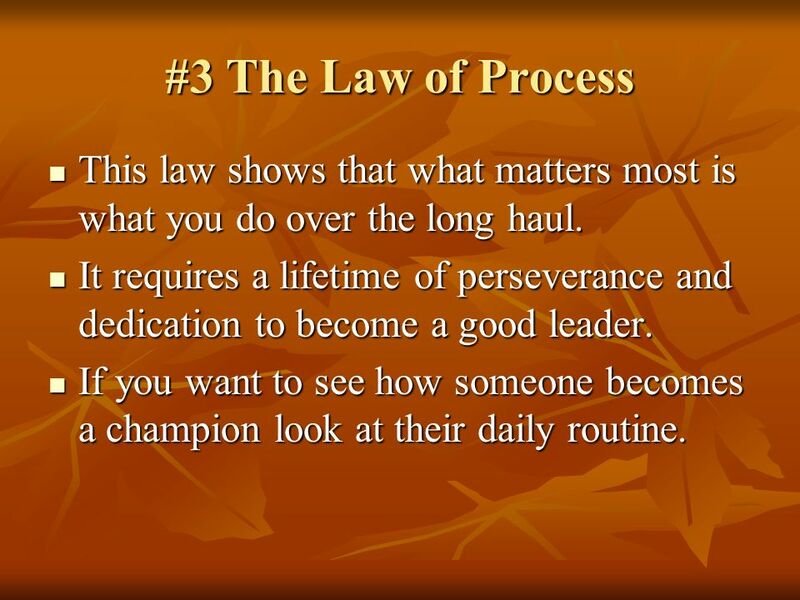 It requires a lifetime of perseverance and dedication to become a good leader. 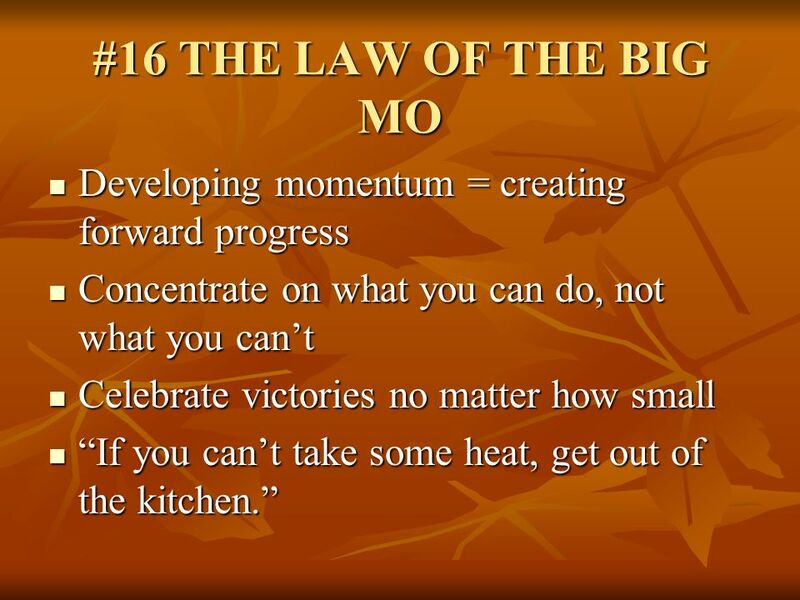 If you want to see how someone becomes a champion look at their daily routine. 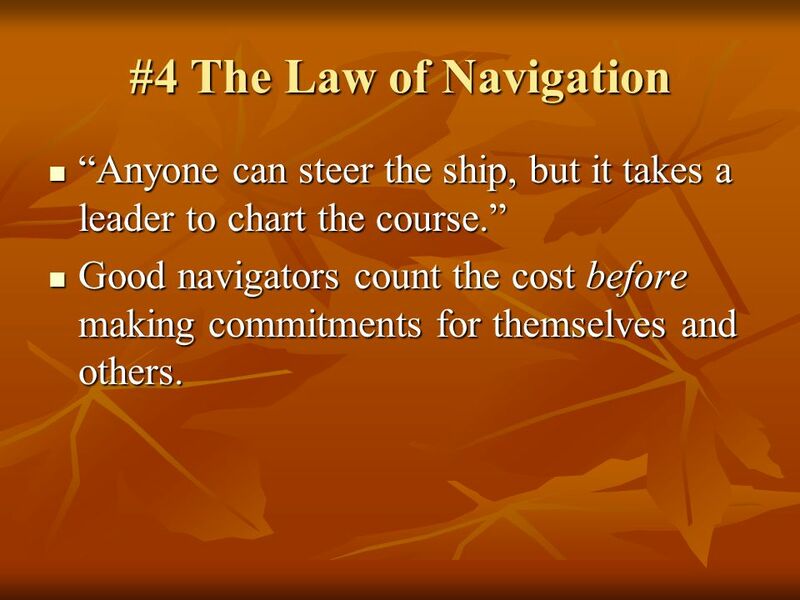 5 #4 The Law of Navigation “Anyone can steer the ship, but it takes a leader to chart the course.” Good navigators count the cost before making commitments for themselves and others. 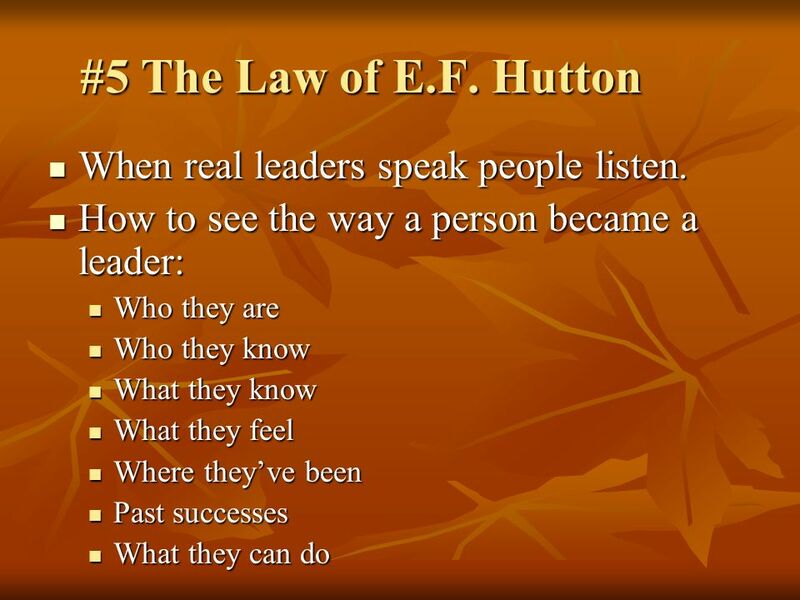 6 #5 The Law of E.F. Hutton When real leaders speak people listen. 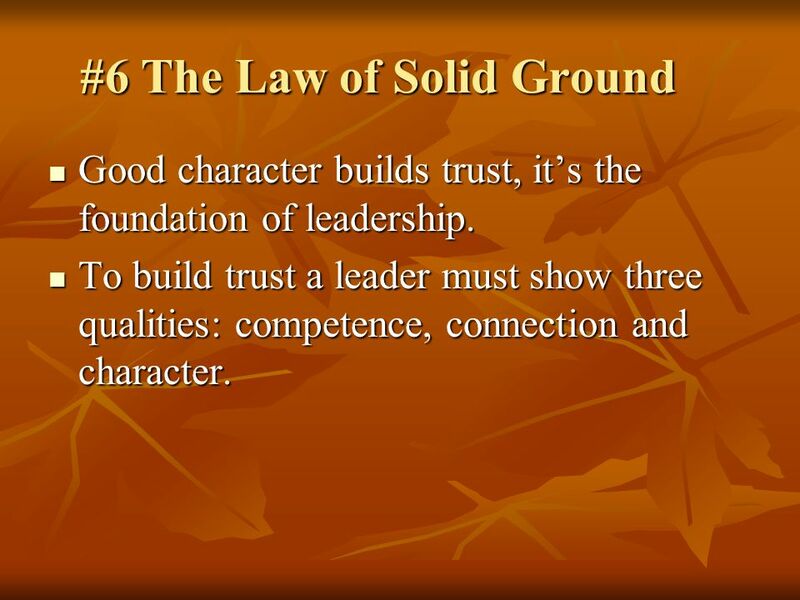 Good character builds trust, it’s the foundation of leadership. 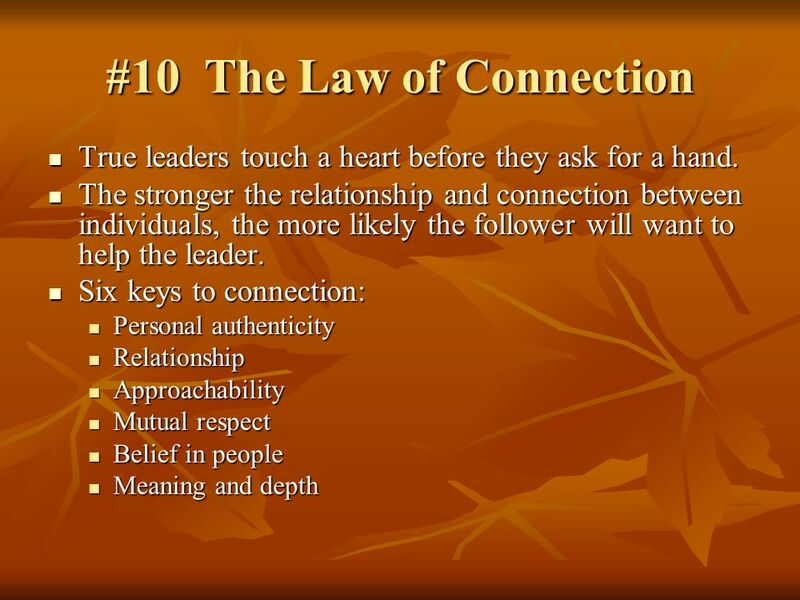 To build trust a leader must show three qualities: competence, connection and character. 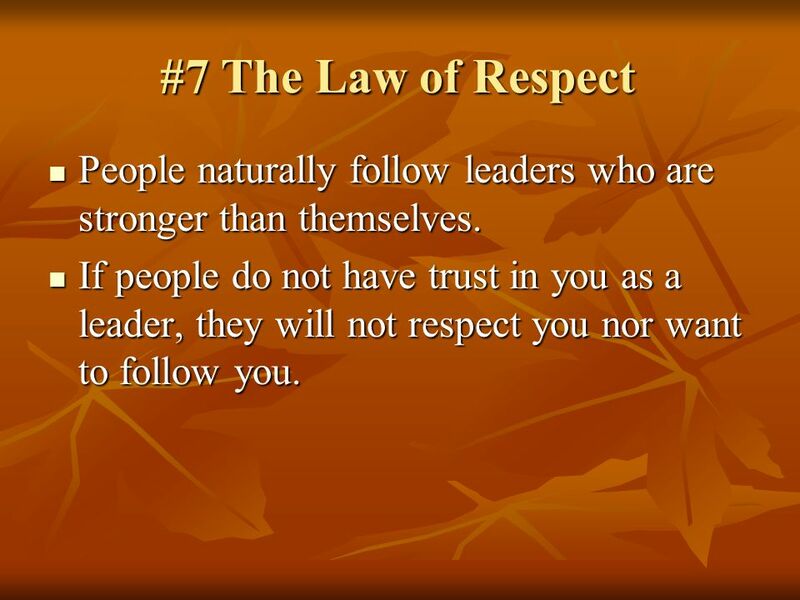 8 #7 The Law of Respect People naturally follow leaders who are stronger than themselves. 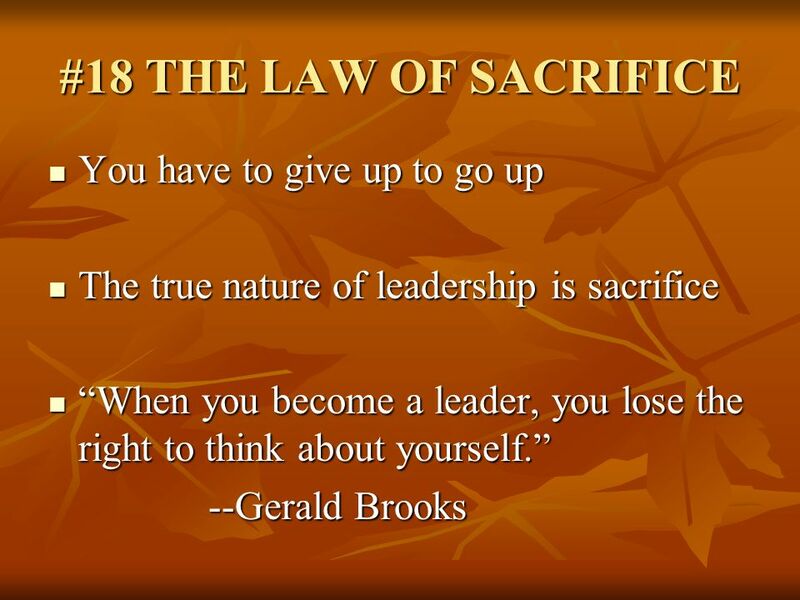 If people do not have trust in you as a leader, they will not respect you nor want to follow you. 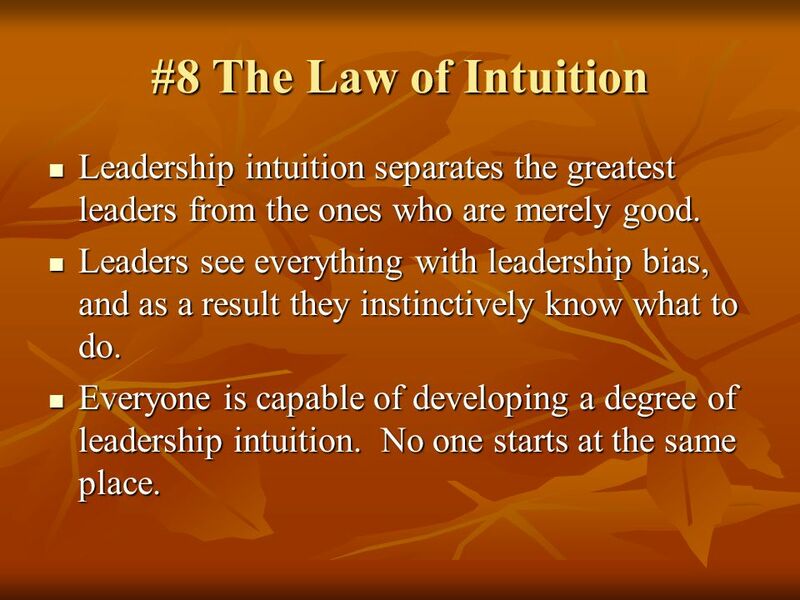 9 #8 The Law of Intuition Leadership intuition separates the greatest leaders from the ones who are merely good. 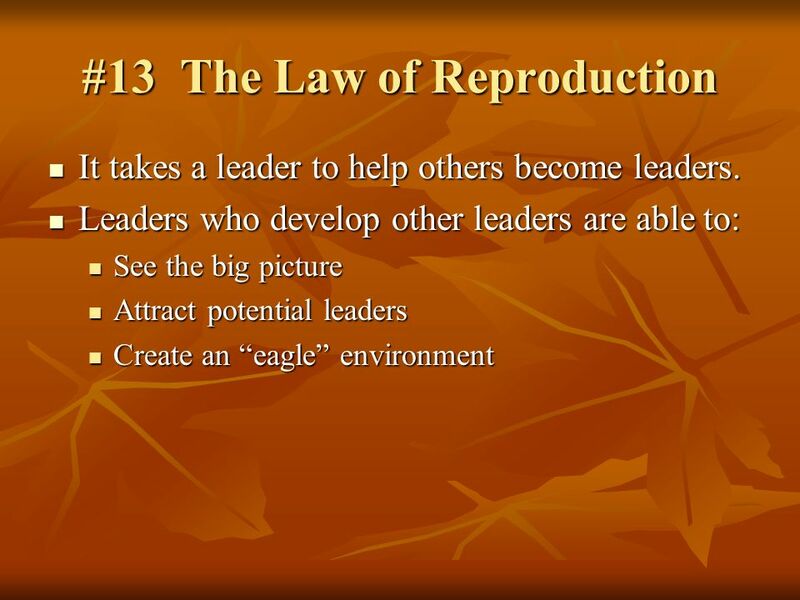 Leaders see everything with leadership bias, and as a result they instinctively know what to do. 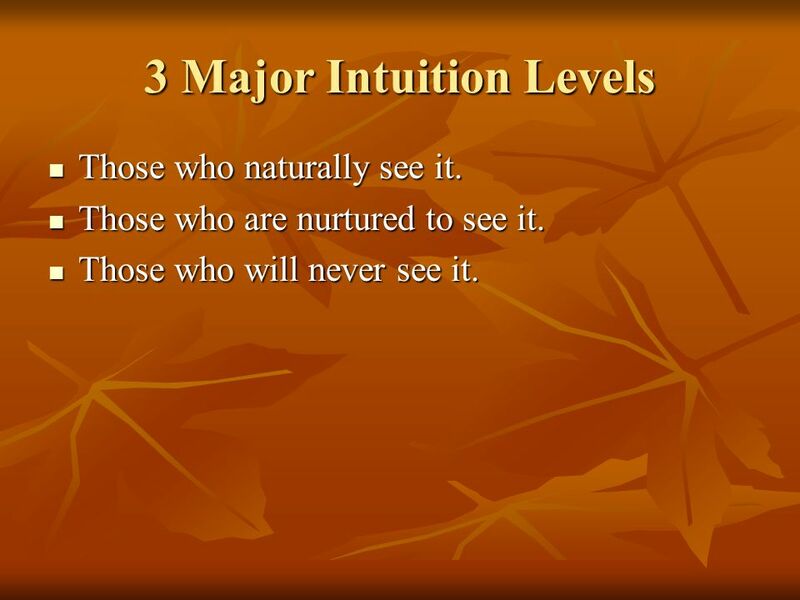 Everyone is capable of developing a degree of leadership intuition. No one starts at the same place. Those who naturally see it. Those who are nurtured to see it. Those who will never see it. 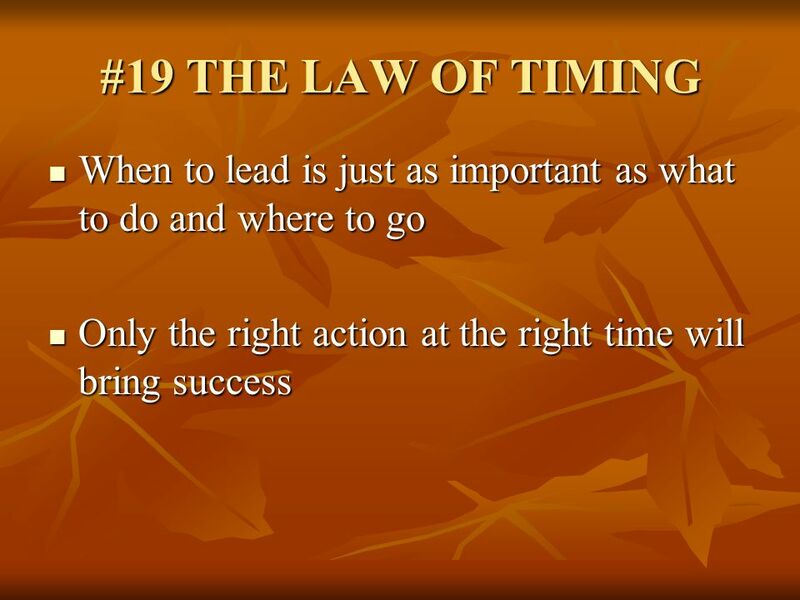 16 #14 The Law of Buy-In People follow worthy leaders who promote worthwhile causes. The leader and the vision always go together. The two can not be separated. 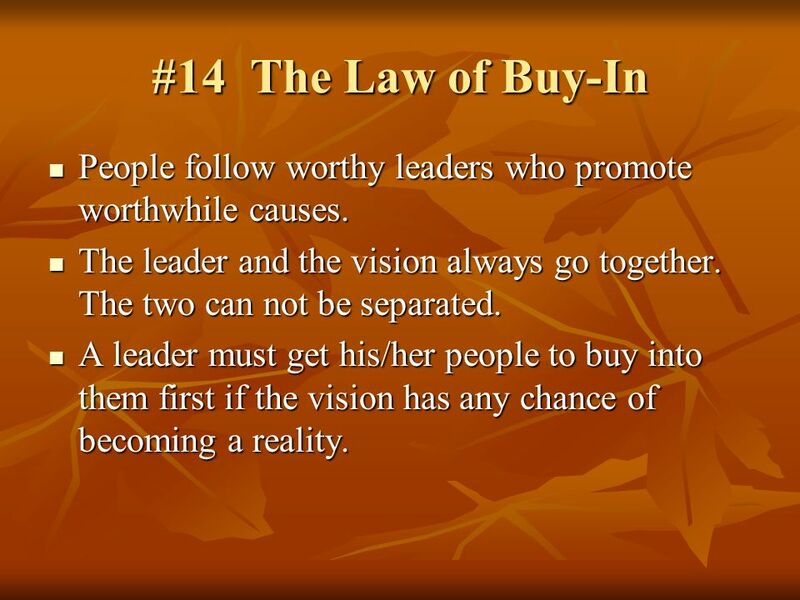 A leader must get his/her people to buy into them first if the vision has any chance of becoming a reality. 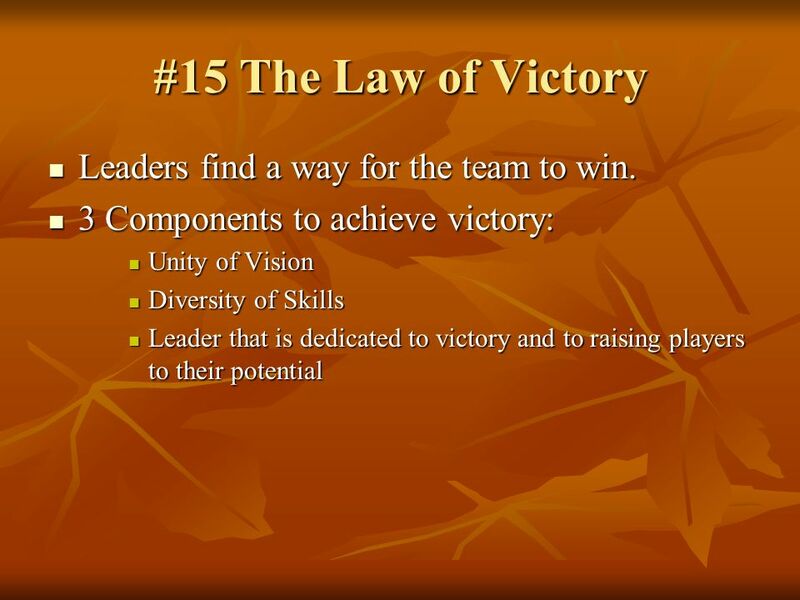 17 #15 The Law of Victory Leaders find a way for the team to win. 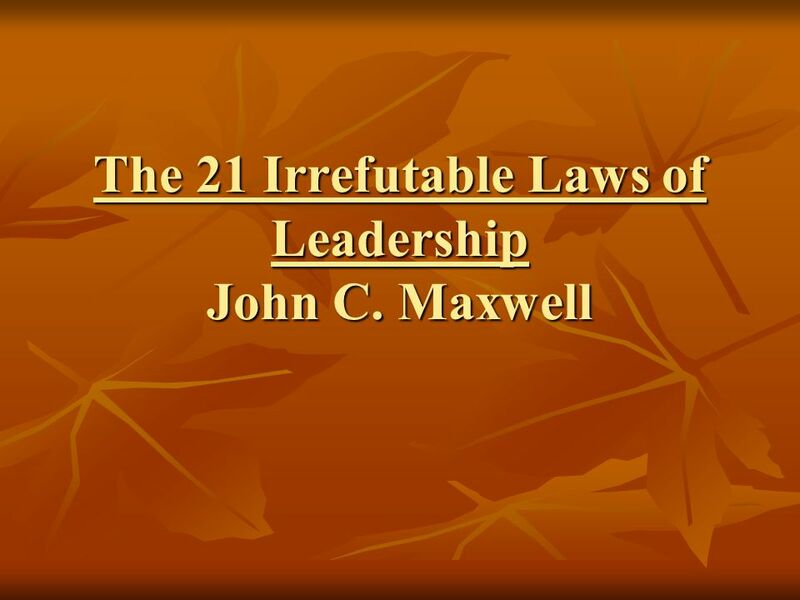 Download ppt "The 21 Irrefutable Laws of Leadership John C. Maxwell"
Is It Bias? Making Diversity Work Is It Bias? Long Workshop Welcome to Is It Bias? Long Workshop © 2010 Sondra Thiederman, Ph.D.Slide #1. Love vs. Infatuation. Building Blocks of Love 1. 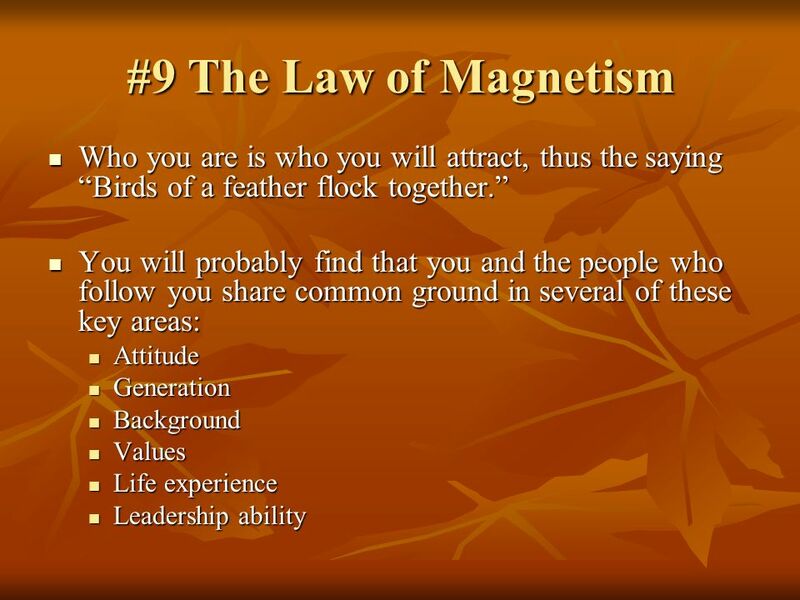 Being Attracted to him/her 2. Being Excited to see and be with him/her 3. Feeling at ease with each other. 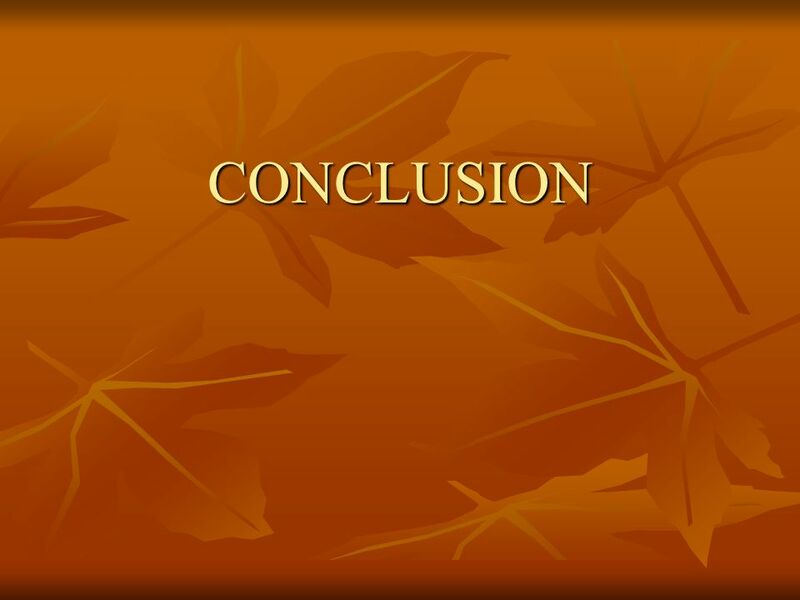 MGT/437 – Project Management © Westbrook Stevens 2001 End Show 6/7/2014. 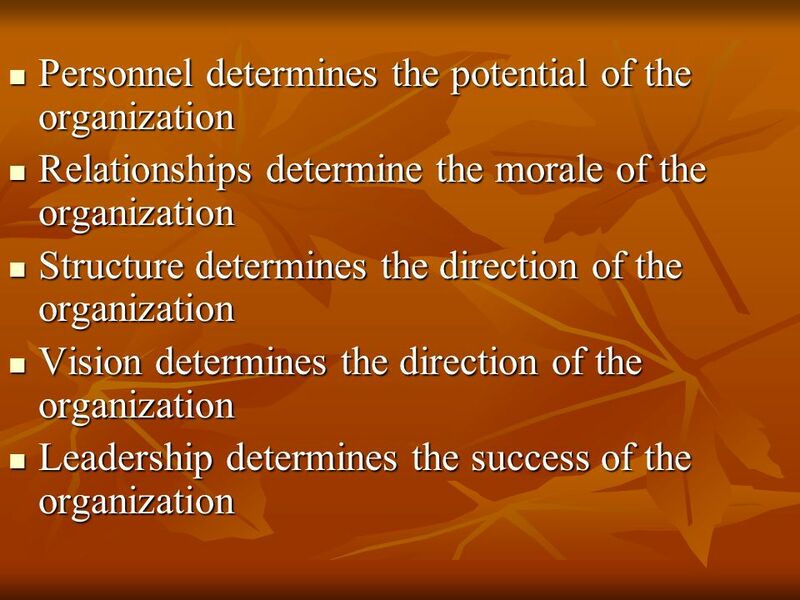 Dr. Leo Maganares Professor Organizational Leadership, University of Phoenix. Regional Council President Training MODULE 1: INTRODUCTION Welcome/Introductions/Icebreaker Overview of Training Becoming an Effective Leader –Leadership. Please silence electronic devices and refrain from using them except during breaks. Your complete attention and participation are appreciated. Overview and Integration 16-1Copyright© 2013 Pearson Education Leadership in Organizations. “Strategies For Success” Your Chance To Make A Difference Sponsored by.